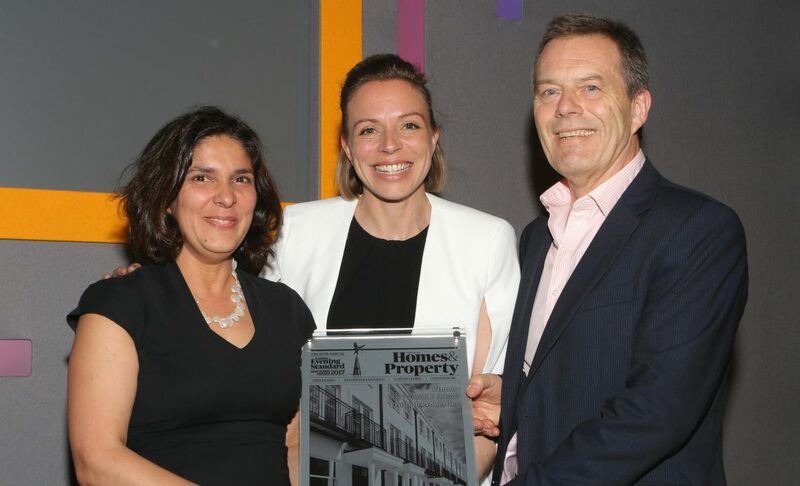 We are delighted to announce that Merchant Terrace, located in Hammersmith W6, has picked up the accolade of Best Family Home over £1.5m at the highly coveted London Evening Standard New Homes Awards 2017. Hosted by comedian Romesh Ranganathan and featuring speeches from the Evening Standard’s new editor George Osbourne, the distinguished ceremony featured over 400 housebuilding professionals from across the UK. The white stucco-fronted properties each feature four bedrooms, three bathrooms and three terraces, including a rooftop terrace with excellent views over London. Internally, the large open-plan ground floor forms the heart of the home, incorporating a flexible kitchen/living/dining space. Built and specified to meticulous standards, the addition of private underground parking accessed via a car lift with direct access into the houses themselves, ensures a level of convenience not usually associated with centrally located townhouses. The development has also won a previous award at the WhatHouse? Awards 2016 for Best House, which is further testament to the quality of these striking family homes. Merchant Terrace is now 50% sold. For further information on the scheme or to make an enquiry, please visit the developments section of the website. The development, located in Hammersmith, W6, has won in the 'Best House' category at the WhatHouse? Awards 2016.